Challenge #142 in the One word One picture series. Hosted by Frenchfx. An early morning rush hour scene at one of the busiest Road in Quezon City - C5 Philippines. I call you attention to the Chaotic overhead wiring...I would not want to be a lineman to troubleshoot that. I beg to differ , the comment about no money ...perhaps it's just bad governance . Great shot. Thanks for sharing. Thanks Weegee!, funny thing about that shot, we just got done with breakfast and was on a 2nd floor lobby of a food court and it was my first morning in Quezon City. 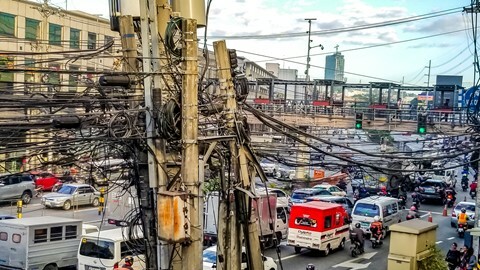 I was bemused by the early morning traffic, the overhead walkway, pedestrian on their way to work and the chaotic wiring infront of it all. It was a perfect image for the subject Chaos....I did not have my DSLR with me so I used my Phone (Samsing S8) camera! Great shot. It just goes to show man's ingenuity in " no money" circumstances. You should see how lamppost are in Vietnam. 29 Does more MP mean more ability to crop?